This recently refurbished, comfortable and inviting restaurant in Tattenham Corner brings a new and adventurous approach to Indian cooking. 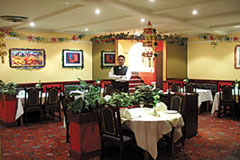 The owners, who have many years experience in operating quality Indian eating places, put great emphasis on originality, fresh ingredients, presentation and customer comfort. With a relaxed bar area in which to study the menu and a stylish dining area, Chilli’s is a welcome addition to Epsom Downs. All day Sunday buffet. Open every day 12-2.30pm and 6-11pm (Fri-Sat 6-11.30pm) All major credit cards accepted (not Diners). No service charge. An extensive a la carte menu complemented by chef's specialities. All day Sunday buffet - eat as much as you like!